Sorry about the lack of post on Monday - I spent a large part of the day lying on the couch in a stupor, fighting my way through a bout of flu, courtesy of Eldest Child, and with my brains full of stupified rage at the gall of some American politicians. But I managed to find some time to pattern surf and find the perfect new deadline project. I found out on Sunday that someone quite dear to me is lined up for some heavy duty surgery in a couple of weeks. I think a pretty lace shawl knit in some cashmere-blend yarn might be just the thing to help with the hospital stay. If I get it in the mail by the middle of next week, I should be in good shape. Oy. The center panel is 25 15 (!) repeats of a 6 row lace pattern. The edging pattern is 20 rows. There's a few rows in between the two. I'm currently working on repeat #8. I'm feeling pretty optimistic at this stage of the game. Stay tuned for the (inevitable) change in outlook. 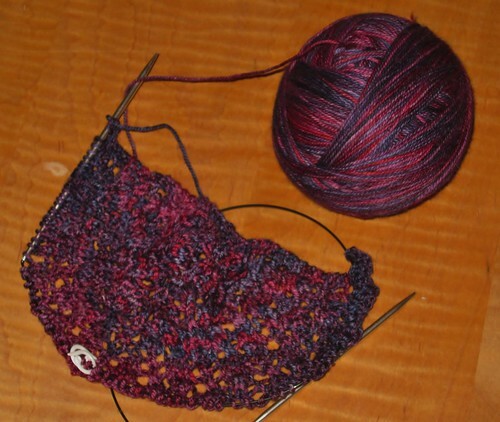 Written by porpoise On August 22, 2012 In "gifts", "shawl"